Fall is creeping in. This morning was crisp! I actually put on my robe. 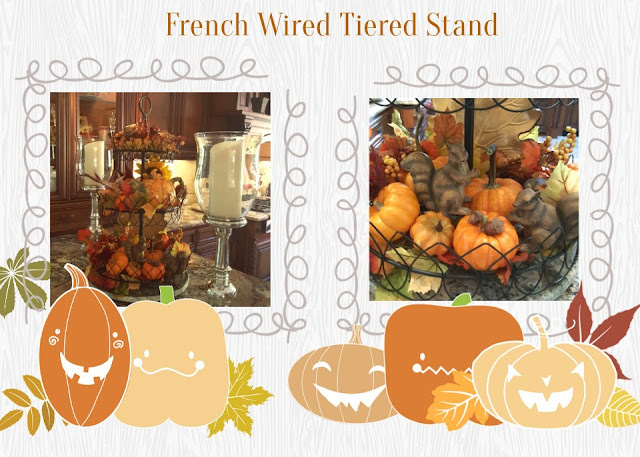 I am sharing my French wired tiered stand today. Since pumpkins are available at the local grocery store, I thought adding them with some greenery and a few accessories would look lovely. 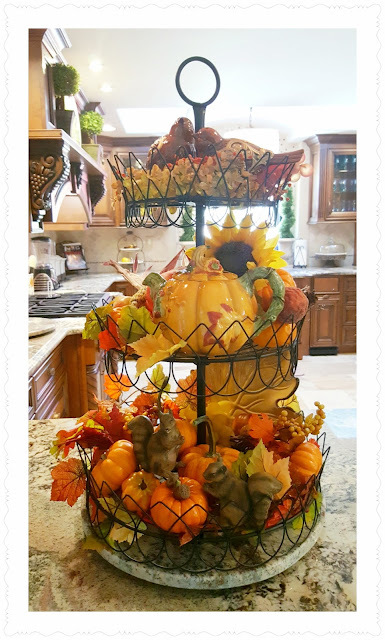 I added a cute pumpkin teapot in this tiered stand. Little squirrels munching on acorns sit in the bottom tray, along with some mini pumpkins. Pretty fall birds are nestled in greenery wreaths on the top tray. These tiered trays are so versatile. Whether you use them for centerpieces, in the kitchen full of fruits and veggies and more. 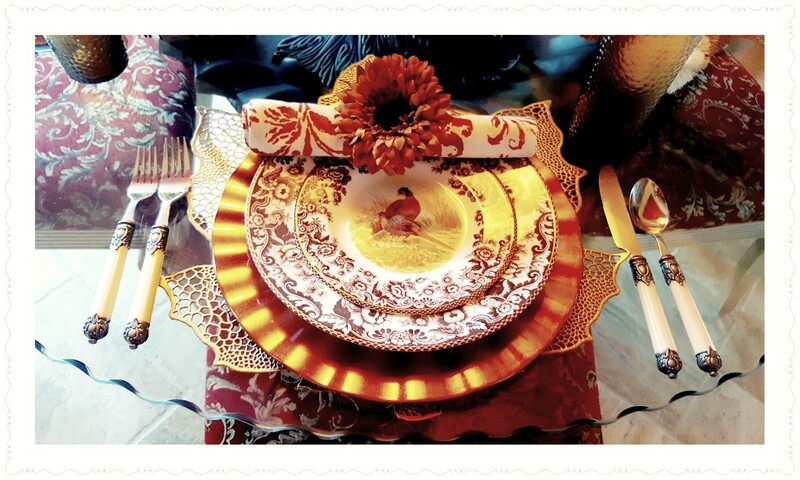 Here's a peek at my upcoming tablescape. 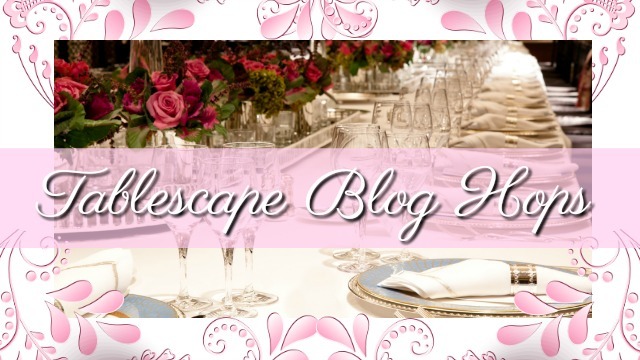 I am joining the hosts of Thought on Thursday for their Tiered Tray Extravaganza Link Party, starting Tuesday morning. Here's the parties I am linking with. Your tiered tray is stunning! And at the bottom of your post I spied Woodland Spode- my favorite. 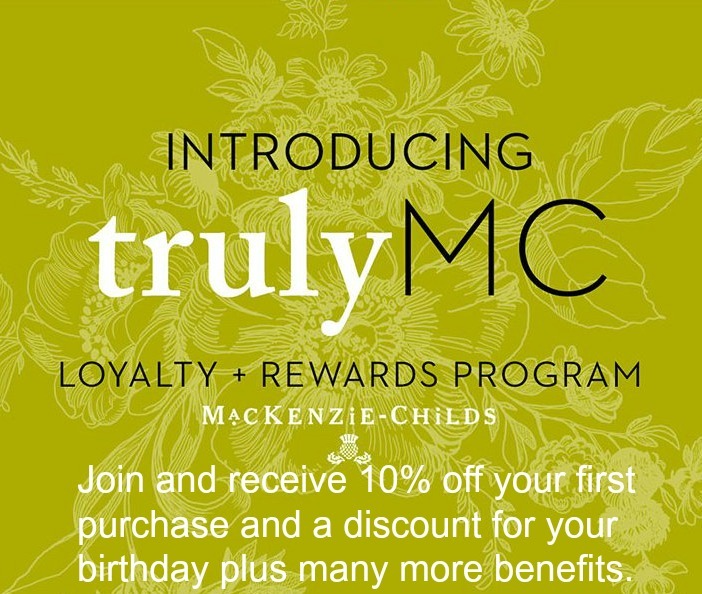 Thank you for joining us Tuesday! Very cute! I love the teapot. The stand looks great in your kitchen. 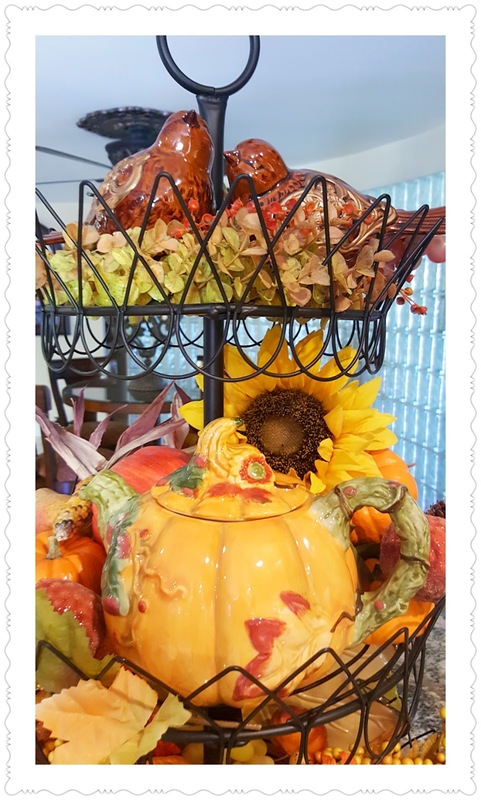 your autumn decoration is wonderful! I love those warm colours! 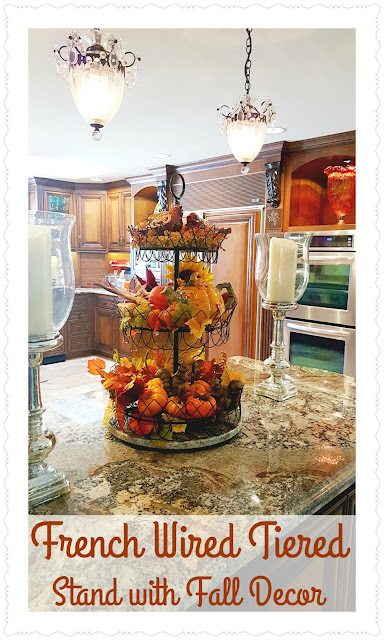 Linda, your fall decoration are winderful!! Here it's still hot to think about autumn. Just bursting with fall loveliness! Very pretty! Your pumpkin teapot is adorable. 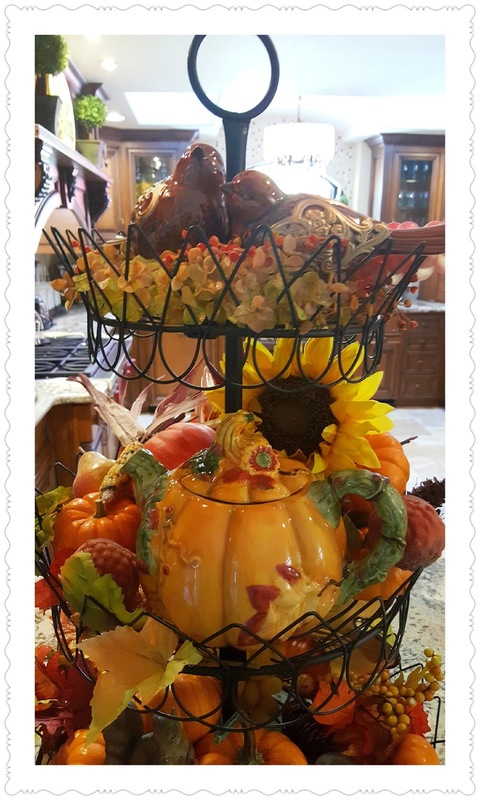 This looks amazing...having a tray to decorate for seasons (and for foods) is so fun..I'm on my first cup of coffee, visiting all the trays...fun party.. This is just fabulous fall perfect Linda! Love it! This is just gorgeous Linda! I am loving your display! 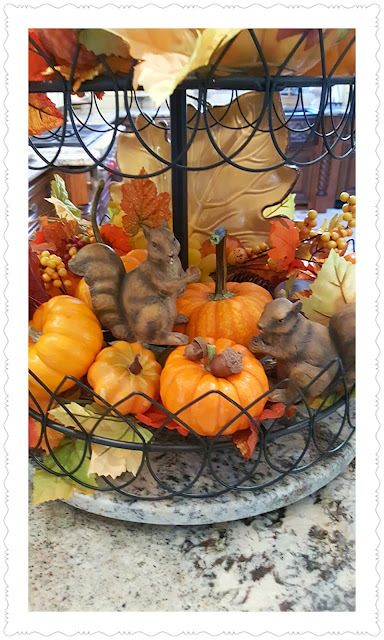 The sweet ceramic pumpkin, the precious litle squirrels among the fall foliage...it just says, "Autumn!" Beautiful kitchen....thank you so much for sharing your talents! 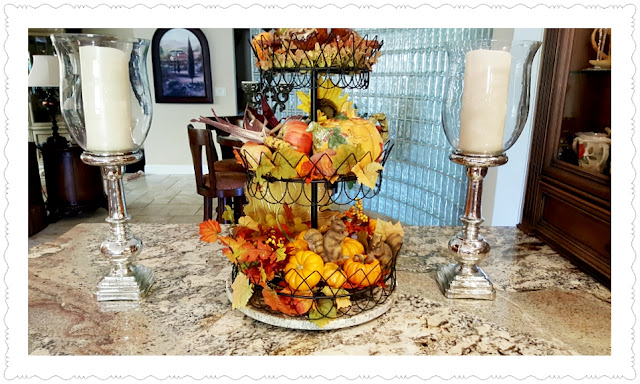 Yours tray is such a festive fall display Linda! I love the squirrels. Linda, your tray is beautiful! Love those little squirrels! Great job! What a beautiful tiered tray display! Those squirrels are so cute, and I just love that pumpkin tea pot! Beautiful tiered tray! Love your kitchen cabinetry too!! You've decorated your tiered stand so prettily for some Fall flavor in your kitchen, Linda! I love it! Hello Linda! In between grading papers and planning lessons, I am on the hunt for mini pumpkins and I can see you have some! NO WHERE can I find these yet, but I can't wait to get mine to decorate! Looking great! 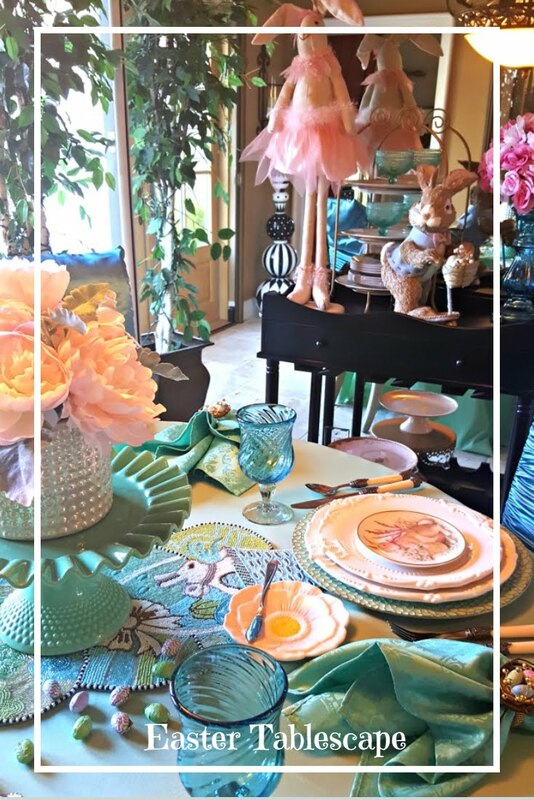 The tiered tray is so full of color and and you table place setting is simple wonderful. I love it. Linda, your tray is so beautiful! Love all of your fall accents! Beautiful..... Loving the fall look and the colors. Great job. Your stand is very french! You have welcomed fall nicely. Sure looks striking on your bar.You do a great job on graphics too. 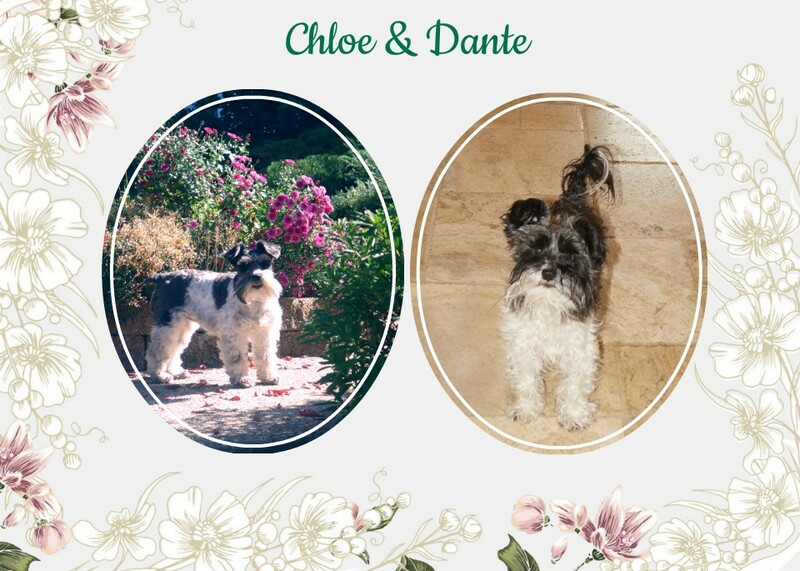 Very sweet! I love the squirrels and acorns. 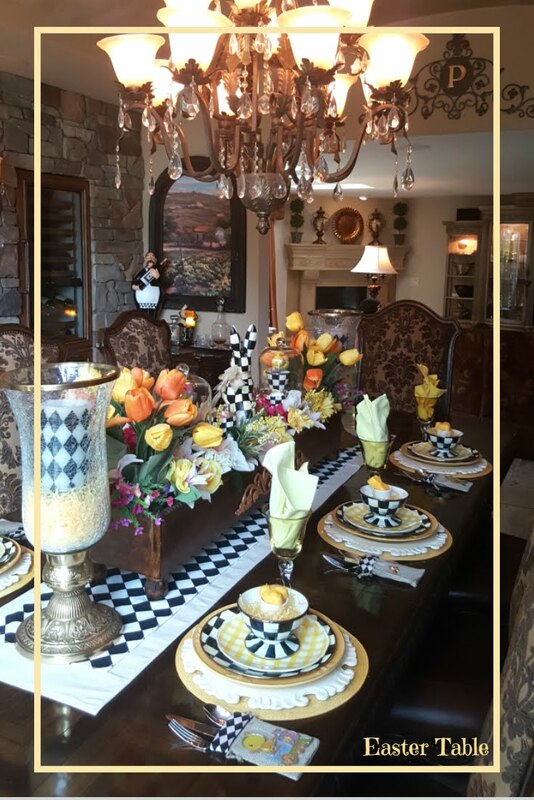 Your tablescape is beautiful too! Beautiful, Linda. Looks like fall around your house. 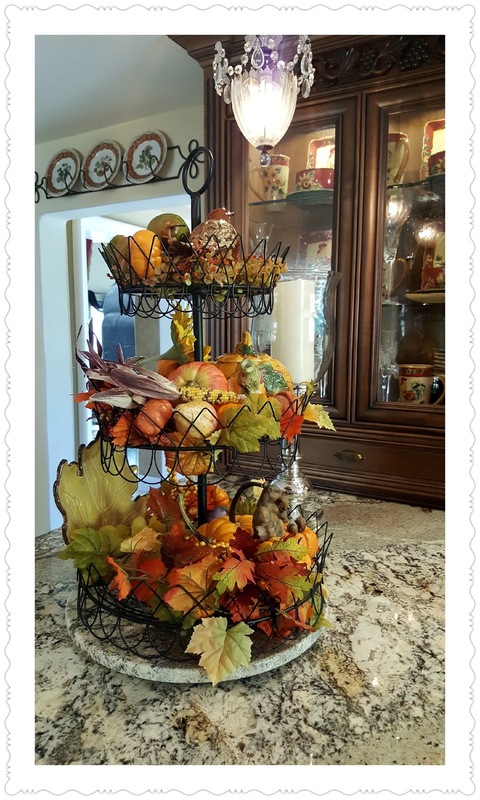 Thanks Linda for sharing this pretty fall stand at Monday's Cooking and Crafting with J&J Link Up! Love it! I want a pumpkin tea pot! Thanks for linking at The Fabulous Fall Party. The link changes tonight so tomorrow is a perfect time to link more posts! 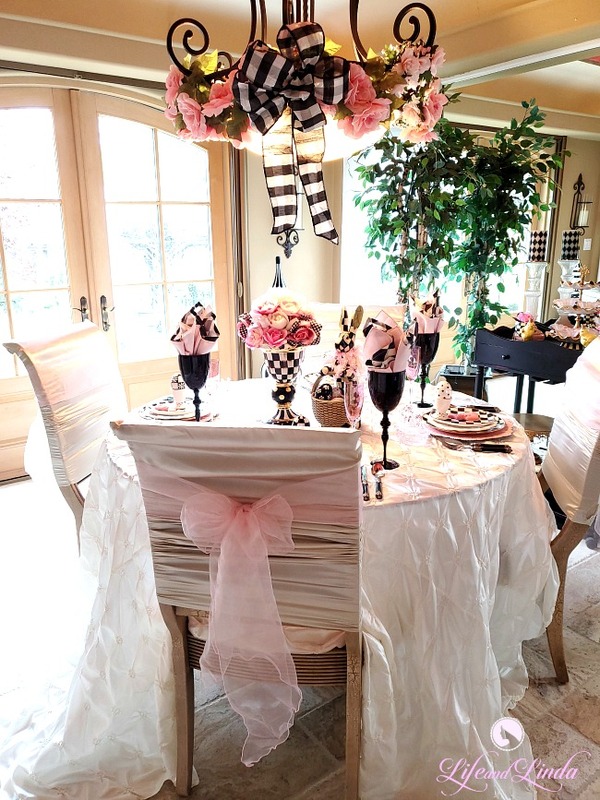 I can't wait to see that tablescape! Your fall decorations are beautiful Linda, we are starting to have cooler mornings here as well, love this time of year. Your autumnal touches are lovely. The squirrels are my favorite. Thank you so very much for sharing this gem. Looks wonderful Linda. The teapot is adorable! There is something about teapots. They are so inviting. Visiting from Decor to Adore Party! So pretty and perfect for this time of year. Thanks for joining us this week at Celebrate Your Story and sharing your link. Very pretty!! Love it!! I just started my Fall decorating and just finished my autumn Tree! Thanks so much for visiting!! Oh I love it! That teapot is adorable and it reminded me that I have one very similiar. I need to get it out! I thought I had seen all of the tiered stand posts...glad I found this! It's beautiful and I love the little tea pot! You are such a pro with decorating. 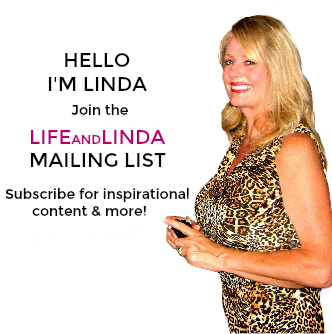 Love this Linda! I may have to clear out my make-shift (made from vintage cake pans) from the craft supplies & fill it with fall goodies. Thanks for the inspiration!